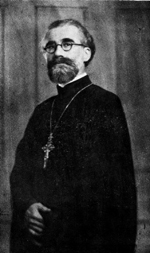 Born Thucydides Constantinides in 1892, he was admitted to the Halki Theological School in 1907 and had his post-graduate studies in Kiev and St. Petersburg during the Bolshevik Revolution. In 1919 he was ordained priest in Constantinople and in 1923 he was appointed Chancellor of the Archdiocese of Athens and All Greece and from 1927 to 1939 he served as Dean of the Cathedral of Saint Sophia in London. During his priestly tenure he represented the Patriarchate at the Assembly of Faith and Government at Lausanne of 1927, and as representative of the Church of Greece at the Conference of Anglicans and Orthodox in London in 1930. In 1939 he was elected by the Holy Synod of Greece as Metropolitan of the ancient historic Apostolic Diocese of Corinth. As Metropolitan of Corinth, he established an Ecclesiastical School, Philoptochos Society and afternoon and Sunday schools. He established the St. Paul Association, held spiritual gatherings and Sunday Bible study. In 1949, the Holy Synod of the Ecumenical Patriarchate elected him Archbishop North and South America. Archbishop Michael wrote many theological treatises in Greek and English. He was also a linguist and was fluent in Greek, English, French, Russian and Turkish. Highly regarded in religious, education and government circles, he received honorary degrees from Yale University, St. Vladimir’s Theological Seminary and General Theological Seminary.